Over at spacing.ca, there’s a post about the difference between Montreal and Toronto transfers, and comments arguing whether Toronto is hopelessly archaic, merely quaint, or actually a system that encourages friendly contact with the operators. In the midst of this, I thought it would be worth looking back at older forms of transfers in Toronto, and this post links to two of them. 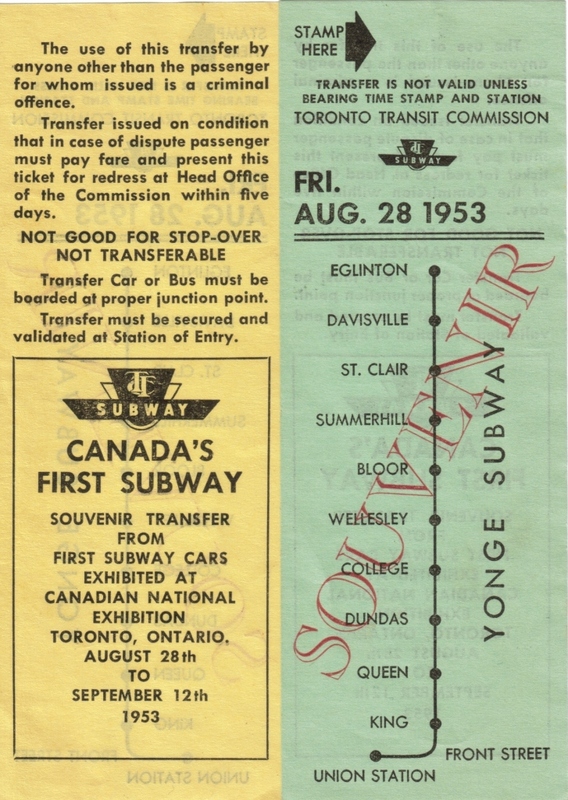 The souvenir transfers are from the display of the first two subway cars at the CNE in 1953. I have shown both the back (left) and front (right) here. The two that I have are printed on different coloured stock, but I don’t know if a wider selection was used. At the top, you can see the area reserved for a station and time imprint from a machine. Passengers picked up a blank transfer (yes, there were new ones printed for each date) and they manually validated it . These transfers include one howler of an error: one station is missing from the map! This missing station almost had a different name from the one by which we know it today. Rosedale is called “Crescent” on many early maps of the Yonge line. At the forum Tuesday evening, the TTC poured cold water on my proposal to swap the CLRV and ALRV fleets between the 501 Queen and 504 King routes claiming that their studies showed that headways below 4 minutes could not be operated reliably in mixed traffic. Others commented on the length of time it takes to get from The Beach or Long Branch to downtown, and as the evening wore on, comparisons became as bloated as the headways on the 501. One speaker claimed he could get from Buffalo to Toronto faster than a trip on the Queen car. This post examines those two issues, and I will update this item if additional follow-up topics come to mind.